Got talent! Bring your voice, your poetry, your beats and your jokes to Mila's Open Mic Night! OPEN MIC EVERY SUNDAY NIGHT 7PM-10PM. Sign-up starts 3pm Sunday. 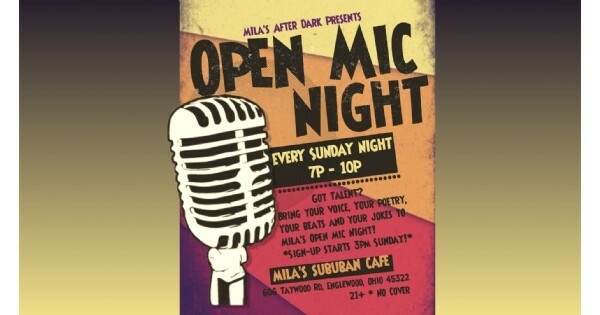 Find more events like "Open Mic Night at Mila's Suburban Cafe"
Mila's Suburban Cafe is located in the Northmont Plaza shopping center in Englewood, Ohio. We are a day and evening lounge that offers live music and entertainment.